One of the suspended Sussex Five, Adriano Marotta, speaks out about the key reason behind his suspension: the near complete “de-democratisation” of Sussex University. Sussex University prides itself on its reputation as a free-thinking university. The current university administration, under the iron-fist rule of Vice-Chancellor Michael Farthing and Registrar John Duffy, has gone to great lengths to promote this image. Postcards for the 50th anniversary of the university featured students holding flares at demonstrations, while the Vice-Chancellor has repeatedly celebrated the socially conscious character of students and their progressive politics. The same cynical celebration of protest does not apply to current students who direct protests at the university administration, as my suspension shows. Together with four other students at Sussex, I was suspended for protesting against the privatisation of the majority of the university’s campus services, and demanding a more democratic university. The suspensions lasted for five days, before senior management buckled under momentous pressure from students and staff at Sussex. The protests proved to be powerful. The furore regarding the draconian tendencies of Sussex university management needs to be contextualised. Senior university managers across Britain are at a crossroads. Like all other British universities, Sussex’s future planning has been in disarray due to the underfunding of Higher Education (HE). Being private charities, universities such as Sussex were forced to respond to government cuts in a variety of ways, including raising tuition fees to £9,000 a year. These cuts to funding are part and parcel of the austerity programme which is used to justify the privatisation of the NHS and education sector. While the current Conservative government has to an extent fundamentally altered the nature of British universities, the scope for change still remains broad. Senior managers are in a position of choice – one they would rarely acknowledge. Either they lobby for a reversal of funding cuts and acknowledge state responsibility for HE funding, or they engage in a radical restructuring of the core functions of the university. At Sussex and elsewhere, they have chosen the latter. As Sussex’s senior management team anticipated the monumental changes to HE before the election of the Conservative government, they undoubtedly expected the protests that followed suit. An institutional safeguard was needed so as not to derail the changes which the managerial ideologues see as the best way forward. It was the Vice-Chancellor’s reforms of 2010 which solidified the institutional mechanisms able to thwart any internal challenge to the changes made by senior management. Michael Farthing hollowed out the decision-making bodies as he removed the remnants of the traditional internal governance structures of the university. Today, the two governing bodies are composed primarily of members appointed by the Vice-Chancellor’s Executive Group or by non-Sussex consultants from the outside business community. The near complete “de-democratisation” marshalled by the Vice-Chancellor in 2010 allowed the university to force radical changes upon its constituent members. These radical changes came in the form of the outsourcing of the majority of campus services in May 2012. Over 235 jobs were affected without consultation, to the dismay of trade unions and students at Sussex. The university did not need to have a transparent debate over these proposals: the previous reforms ensured that decision-making power rested exclusively in the hands of the Vice-Chancellors Executive Group. The continuous call for more democratic involvement by students and staff in university decisions has been a consistent demand of the anti-outsourcing movement – and one which has been repeatedly ignored. Posturing defiantly in a meeting with representatives from all sectors of the university, John Duffy was recorded in March 2013 claiming that he would not overturn the university decision to outsource 235 jobs, even if all the students and staff at Sussex stood outside his office protesting against it. The methods and rhetoric employed by the directors of Sussex University are emblematic of an attitude associated with the current restructuring of HE. Behind it lies a didactic assumption which is at odds with how universities have historically been run: senior management, composed primarily of non-Sussex academics, know what is best for the university. When these managers are threatened by a movement as strong as the Sussex anti-privatisation campaign, they become scared. They resort to intimidation and wilful ignorance of the demands of the protestors, because any internal resolution through the existing decision-making bodies is both impossible and undesirable. As a last resort, students engage in disruptive activities such as occupations. Since February 2013, Sussex University has seen the Conference Centre occupied twice for a total of nine weeks. Additionally, there have been five other occupations which shook the university campus. Students and workers recognised that their repeated calls for more dialogue, a consistent demand of all the occupations, had so far only been met with repression and intimidation, including a violent eviction of the first occupation in April which led to riot police arresting four students. My suspension and that of the other four Sussex students comes at a critical juncture. The university has realised that the campaign for a more democratic university will not subside at the end of the academic year. We have borne the brunt of the scare tactics from this increasingly isolated clique of senior managers. The five of us have been forbidden from making contact with each other as we wait for our kangaroo court hearings on the 17th January. We are not expecting a fair trial: the Vice-Chancellor appoints two out of the three members of the disciplinary committee. Indeed, we are not the first students suspended under his reign. In 2010, six students were suspended for their “leading roles” in a strong movement of students and staff that opposed the management-led cuts to teaching and the restructuring of internal democratic procedures. Senior management called riot police to campus in March 2010 to break up a peaceful occupation because Registrar John Duffy falsely claimed that he was held hostage by students. 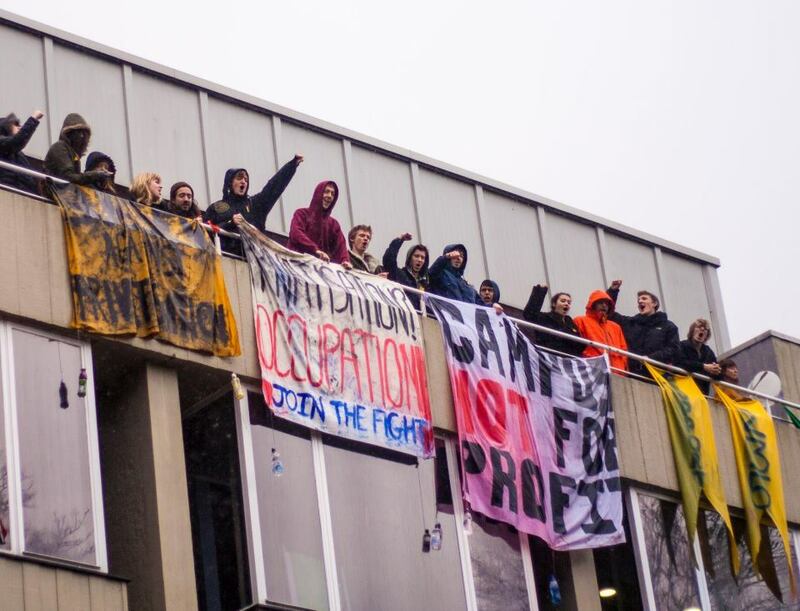 In fact, since 2010, Sussex university management has gained two high court injunctions banning all forms of protest on campus, while a total of 11 students have been suspended for protesting. Police have become a common sight on Sussex campus during demonstrations as the university regime becomes increasingly desperate to silence all those who speak out. The “ruling elite” of Sussex University are consciously undermining the reputation of the institution that they are trying to promote: a university which values critical thinking and supports the plight of those worst off. We may be expelled from campus as a result of the disciplinary action taken against us simply because we have consistently called for a university where decisions which affect everyone are made by everyone. The University is criminalising our only existing avenue for dialogue. They are criminalising our right to protest. A dystopian future awaits Sussex as managers enforce their markestisation-without-consent, and criminalise dissent. If left unchallenged they will kill the vibrant community which makes Sussex unique, and bury its reputation with it. Adriano Mérola Marotta is a 28 year-old Uruguayan-Swedish graduate from the MA in Global Political Economy at the University of Sussex. He currently works as a freelance journalist. I’ve looked at the membership of Senate and it appears to be composed mostly of elected academics, like any other university senate. Can you tell me where I can find out more about these reforms?